If you have trouble viewing images in this email, add enews@cccfm.org to your Address Book or click here. As promised, here is the poached pear recipe. This is a great way to have a dessert without high sugar or fat using seasonal fruit. I used the Alhambra Valley Pear people's Bartlett pears and they need no peeling. Quick and easy, remember I am doing this stuff in a parking lot! Bring wine, cinnamon, vanilla and honey to a slow boil. Add the pears and let simmer for 5 to 15 minutes depending on your preference in texture. You can pierce with a knife to check. Turn off the heat and let pears cool in the wine liquid. Remove to a plate and bring the liquid back up to a boil. Reduce to a nice syrup. Mix yogurt with honey, cinnamon and vanilla. Place a pear half in a bowl. Spoon some yogurt over and sprinkle some cookie crumbles. Drizzle a bit of syrup over. I will be doing a cooking demo of these pears for Festa Italia on Sunday September 23 at the Martinez Farmers' Market. Look for a cooking demo on September 29 at the Pleasant Hill farmers' market using something local and luscious to tempt your taste buds and get those creative juices flowing! 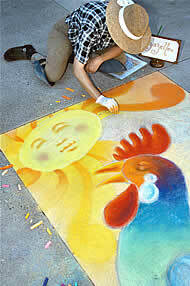 The festival season is in high gear and the Martinez Sunday Farmers' Market is once again partnering with the Italian Street Painting Festival by welcoming chalk artists on the Downtown Plaza! This event is celebrating its 3rd year and benefits the alcohol free New Year's Eve Celebration "First Night". The list of entertainment includes the Martinez Opera! Also, featured at the farmers' market is the blue grass band the "Idyll Frets"... a couple of kids and their dad - it's a real treat! Come down and join the old fashion fun. Fresh fish is waiting for you... Coast Side Farms is realing in the fresh salmon catch at the Martinez Market on Sundays. They bring a full compliment of beautiful smoked salmon and spreads for your "Football menues"- they include Whitefish, Albacore, and Smoked Salmon. A special dinner in N. California will raise support for Slow Food Nation, at an unprecedented public event that aims to change the way Americans cook and eat food! 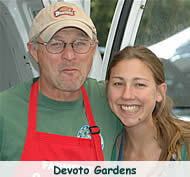 Slow Food Delta Diablo invites you to EAT IT TO SAVE IT!, a Harvest dinner at Knoll Farms. Fun(d)raising dinner in the field. Action of the 2007 Farm Bill is moving to the US Senate. The Senate Finance Committee is now reviewing the 2007 Farm Bill beginning on September 19. The House passed Farm Bill (H.R. 2419) which made some changes to improving the quality of the meals in the U.S., by providing children with healthier food choices in schools, by supporting small family farms and local businesses and by protecting the environment. The progress can continue with your help. Click to learn more about what you can do to help. Next issue of The Lettuce Leaf Newsletter will be on October 5. Cooking Demo: Lesley Stiles has a cooking demo of Bartlett pears for Festa Italia on Sunday September 23. The Italian Street Painting Festival is chalkin' up the sidewalks this weekend on Main Street but don't worry - the market is still on! To make room for the festivities we'll be relocated down to the end of the 600 block and continue onto the 500 block with all your favorite vendors. I'll see you then! Being at the Farmers' Market every week is a great way to feel connected to the earth and the changing seasons. Fall is definitely upon us. Gourds and pumpkins are already making their appearance on Rose Lane's tables. Fall colors grace the beautiful bouquets created by Ana at Ruvalcaba Farm. Fresh pressed apple cider from Rainbow Orchards and tart pomegranate juice from Lone Oak Farm are favourite autumn treats that taste so refreshing on a crisp fall day. Side by side with these local seasonal offerings you will still find summer squash, tomatoes and juicy sweet peaches and plums, truly giving us the best of both worlds. Are you a football fan? The Cal game doesn't start until 3:00pm so whether you're going to the game or watching it on television you'll have plenty of time to stop by the Farmers' Market to pick up some healthy snacks. Go Bears!! This Saturday Terra Soaps and Old World Sausage will be joining our line-up for the first time. Holding Ranch will also be back with that grass-fed beef you all love. I hope to see you at the Market. Cooking Demo: Lesley Stiles on September 29th. There is an interesting web site put up by Ken Cook, the president of Environmental Working Group, a public interest research and advocacy organization known for its Farm Subsidy Database. The site shows who gets the money from farm subsidies. Most informative as to where your tax money goes. The cool summer has been good to the produce season so we still have some great fresh fruit and there is still time to preserve some for a lovely winter treat. If preserving is beyond what you want to do don't forget about drying. You can dry in the oven (200 degrees until you like the texture). Drying works for tomatoes, grapes and all the stone fruit. Have you ever tried a dried pear? Dried fruit makes a nice hostess gift too. We are so lucky to have such great farmers bringing us such tasty produce. On a sad note I would like you to keep a good thought for Mr. Sou Vang of Vang Family Farms, he had a stroke about two weeks ago. Their stand at our market was the first one on the left as you enter from Cresent Dr. He has seven children from 11 to 22 and this has been very hard on the family. I don't know when they will return so keep a good thought and we will hope for the best. See you Saturday. Good chance your favorite apple is at the market right now. Devoto Gardens, Rainbow Orchards, Smit Farms and several others have some tasty, crisp, and sweet apples for you. Some varieties are short lived so get to the market and enjoy! There is always a lot going on this time of year, festivals and the like. Make time for your trip to the farmers' market, we are open early so you can stop by, get your goodies and be back home before the rest of the clan is ready to set off on the families big adventure. Sunday, September 23rd marks the start of fall... what happened to summer? It was here a minute ago. I overheard a young girl say to her mother this past Sunday "It's almost Halloween! They have jack-o-lanterns already." Yep, pumpkins are here and following will be the winter squash, soups and stews. Ahhhh, fall. Revel in it! Late summer and early autumn air have an electricity and lightness that is clearly palpable on your skin and in your breath creating a nice tingle of exciting expectation. Four times a year we experience a slight rebirth with our seasons changes bringing renewed energy and hope that we can count on to move through another cycle whether it be conscious or not. Crops must feel the same energy we do because they suddenly either have a huge rush of production for one crop or a clear ending for another. In the markets at this time of year the stone fruits start to wane but are probably the best tasting of the year. 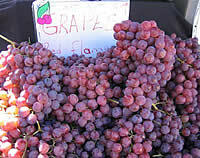 Grapes are exploding all over loaded tables with a variety of sizes, shapes and colors. Do not pass seeded grapes by, they are worth the seed spit out. Beans are especially happy in late summer and reward you with extra snappy crispness and sugar sweet flavors. Try the flat Romano kind if you are lucky enough to find them. These want to be cooked a little longer than the Blue Lake and work very well braised in chicken stock and a little olive oil. Our Sun Gold tomatoes in the Troy Spencer garden are coming to a sweet close. This is sad because they have been lusciously abundant and tasty this year. Our tomato sales to Nibblers and Haute Stuff financed our materials for the Community Service Day / Make a Difference Day that we had at our school this past Saturday. We had a great mix of volunteers and really gave the garden a motivating face lift while readying it for an onslaught of sixth graders to get propagating winter crops next week. The College Park Organic Garden also had an amazing flow of volunteers from the community. We put in an irrigation system for the Food Classes Eagle Scout planter boxes. That teacher has to be happy and getting ready to plant herbs for her classes. The rest of the garden got weeded, cultivated and amended for the Special Day and Environmental Science classes to get busy. We were able to buy some very cool composters for the Biology classes thanks to Kaiser and NEAR, for a great composting all school project those classes are doing for the garden. Our salad bars are bursting at the seams with locally grown produce and we have many happy high performers chowing Stan Devoto apples and Medina berries along with a whole host of other great vegetables and fruits. Once again thanks to Kaiser Permanente for their generous support of these projects allowing students the opportunity to see first hand where food really comes from and how it really tastes. Broken Record Alert! Get out in those hills folks because this is the season for it. There are birds everywhere and little coyotes and foxes preparing for some cooler weather. The trees are turning and the poison oak is out of disguise wearing a bright scarlet warning. Lesley Stiles can be reached at chef@cccfm.org or on the market hotline 925 431-8361. I always thought the first day of fall was on September 21 - today. But I stand corrected as I find information pointing to Sunday, September 23 as the first day of fall in 2007. In the language of science, an equinox is either of two points on the celestial sphere where the ecliptic and the celestial equator intersect. For the rest of us, it's one of two times a year when the sun crosses the equator, and the day and night are of approximately equal length - precisely 5:51 A.M. EDT on September 23, 2007 is the fall equinox. But a few days here or there to kick off fall won't affect what I find at the farmers' market. Most stone fruit growers are winding up for the season, but there's a final flurry of O'Henry peaches available at the Rainbow Orchards market stand. Rainbow Orchards sits at the 3000 foot level in beautiful El Dorado County where it's cooler and the growing season starts and finishes much later than growers in the valley. The O'Henry is a large, red fruit with only a slightly fuzzy skin - hooray! The yellow flesh is sweet and juicy and may show a little red streaking - and it's delicious. Hard shelled squash are making their debut. I'm almost as tempted to buy a squash for its aesthetic qualities as much as for its flavor. Rose Lane Farm is showing off some of the beautiful heirloom squash they've been growing at their Oakley farm. The White Tennessee Sweet looks like a very large pear so it attracts me immediately. The Cheese Pumpkin Squash has a unique smooth tan skin with moderately deep ribs. Its sweet flesh is deep orange in color and they're great keepers. Growers Penny and Vince Granberg say there are plenty more varieties on the way. Bins of beautiful, deep red pomegranates are also arriving at the markets. I'm still holding on to a bowl full of dried pomegranates from last season - they turn a deep burgundy color as they dry. To get to the shiny red kernels under the leathery skin of a fresh picked pomegranate I recommend the underwater method. Use a sharp knife to cut a thin piece off the crown of the pomegranate. Slit the skin from top to bottom in 3 or 4 places and pull the fruit open using both hands. Immerse the sections in a bowl of cool water and soak for 5 minutes. Holding the fruit under the water, separate the seeds from the membrane. The seeds sink to the bottom and the pith floats to the top to be discarded. 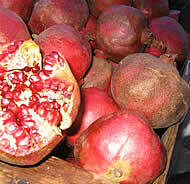 I'm ready to toss a handful of pomegranate kernels in salads, add to yogurt or garnish entrees. Enjoy and see you at the market! Barbara Kobsar can be reached at cotkitchen@aol.com or call (925) 933-2552. To sign up for CCCFM's Weekly E-Newsletter, click here!